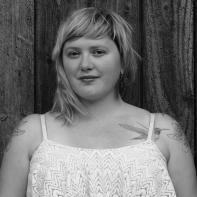 Luiza Flynn-Goodlett is the author of the chapbook Congress of Mud (Finishing Line Press). She received her MFA from The New School and was awarded the Andrea Klein Willison Prize for Poetry upon graduation from Sarah Lawrence College. Her work has appeared or is forthcoming in numerous literary journals, including ZYZZYVA, New Ohio Review, The Missouri Review Online, and The Greensboro Review. tosses it into the undergrowth. licks the canyon's cracked lip. rapids when a levee splinters. fire, then press chest to ash. skin you wore a spent match. to cling like a damp suit we had to claw off. the drain, gaze up at the distorted world. cars and numbers tattooed on an arm. makes manifest what we already knew.